New solid sorbent materials are sought for CO2 capture, as presently available multi-scale porous materials lack sufficient capture efficiency and gas selectivity. Our objective is to develop metrologies and standards as well as structural, thermodynamic and kinetics data for multi-scale porous materials to support the development of sustainable technologies such as CO2 capture and sequestration (CCS). Low-cost capture of CO2 could significantly reduce net CO2 emissions from stationary sources (coal-fired electric power plants are the greatest emitters) by as much as 90%. Innovative in situ X-ray and neutron scattering metrologies, sorbent property diagnostic tools and computational modeling will enable development of more efficient, multi-scale porous materials for capturing CO2. The materials-by-design approach taken to facilitate development of new CO2 sorbent materials can serve as a model for other materials genomics efforts supporting U.S. industry. establishment and demonstration of a materials-by-design approach inspired by sorbent materials provided by the Department of Energy's National Energy Technology Laboratory (NETL) and other stakeholders. The main neutron and X-ray techniques are single-crystal and powder diffraction for structure determination, small-angle scattering for powder morphology and following lattice spacing changes during gas sorption cycles, X-ray absorption spectroscopy for chemical sorption, and inelastic neutron scattering for physico-chemical sorption. Property measurements include: high pressure thermogravimetric analysis for direct measurement of CO2 sorption kinetics, thermal and chemical stability, and regeneration ability of sorbents; evolved gas analysis for simultaneous gas sorption measurements of gas mixtures under gas flow conditions; high pressure differential scanning calorimetry for thermodynamic analysis; and high-pressure Sieverts apparatus for volumetric measurements of CO2 sorption. Computer simulation methods include Monte Carlo and density functional theory calculations in support of the materials-by-design strategy. 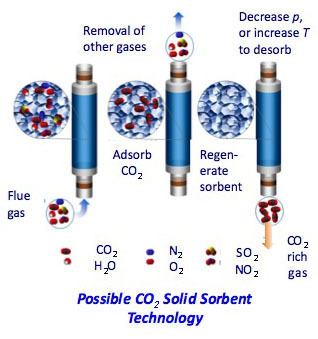 The need for efficient processes to capture CO2 from the flue-gas stream has led to renewed interest in adsorption-based separations and hence new sorbent materials. New classes of structurally dynamic porous metal–organic frameworks (MOFs), or porous coordination polymers (PCPs), which contain flexible linker ligands between the lattice planes, can provide great structural versatility for such applications. Figures 1 and 2 show how the ligand spacing in two such MOFs can expand and contract through a CO2 adsorption/desorption cycle, measured in situ by small-angle neutron scattering. Through a combination of organic and inorganic building blocks, these multi-dimensional host materials can be tailored for preferential adsorption of one gas species over another. The Material Measurement Laboratory and NIST Center for Neutron Research scientists have been working with NETL using Fourier transform infrared (FTIR) spectroscopy, gas chromatography (GC), X-ray diffraction (XRD) and in situ neutron scattering studies to address critical measurement issues for carbon capture solid sorbents. Figure 1. Bpene = Ni(1,2-bis(4-pyridyl)ethylene)[Ni(CN)4] and DBM = catena-bis(dibenzoylmethanato)-(4,4'-bipyridyl)nickel(II). Courtesy JT Culp et al., NETL. One of the most crucial issues to address in structurally dynamic MOFs relates to the gas interactions with active sites in the sorbent before and after transitions between states of differing porosity associated with gas adsorption or desorption. In principle, the existence of different threshold pressures for different gases, above which a rapid rise in gas uptake occurs in many structurally dynamic MOFs, offers the potential to selectively adsorb gases. However, a major concern is that "cooperative adsorption" could occur, whereby one gas initiates and stabilizes a structural transition to allow all other gases in a mixture access to the open pore network. The mere presence of a threshold pressure or "gate opening effect" for one gas species at a given pressure and temperature does not necessarily mean that the same threshold will apply at the same partial pressure for the same gas within a gas mixture. Thus, selective adsorption of one gas over another at a given temperature and partial pressure is not guaranteed over another gas that has a different threshold pressure when tested as a single gas. Unfortunately, no theoretical or measurement-based formalisms currently exist to predict when co-operative versus selective adsorption will occur for a given gas mixture. However, well-designed FTIR adsorption/desorption isotherm measurements and coupled GC head gas composition measurements at NETL have now been combined with XRD and in situ neutron scattering structure and microstructure measurements at NIST in which samples were dosed with CO2, N2 and a CO2/N2 mixtures. These experiments have established unequivocally that true selective adsorption for CO2 over N2 does occur in at least one promising structurally dynamic MOF or PCP, DBM. Figure 3 illustrates the selectivity of DBM for CO2 adsorption over N2 adsorption. Work continues to explore selectivity in other structurally dynamic MOFs with gas mixtures of technological importance. Download our project brief (PDF).